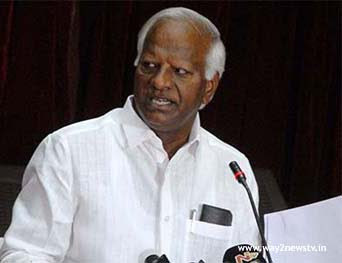 Telangana state deputy chief minister and education minister Kadiyam Srihari strongly opposed Congress leaders. They said that they were going to be corrupt and illegally trying to exploit the bus trip. The development of Telangana state in all the states, all parties are praised ... if you come here and look at the eyes of Congress leaders in the state. Only the CM seat will be visible but the state development was not visible. Kadiyam Srihari Speaker Madhusudanachari, MP Pasunooiari Dayakar and local leaders and officials have been constructed godowns with three crores of rupees in the village of Arepalli in Bhupalapalli district. Deputy Chief Minister Kadiyam addressed the meeting there. Deputy Chief Minister Kadiyam Srihari said that CM KCR has made the country the number one welfare state in the country by implementing development and welfare schemes in the country with the aim of developing Telangana. The rulers of the past said that the famine would come when the Telangana would come, the power or the floods and the farmers would be farming or Annamo Ramachandra. But after the state of Telangana, Chief Minister KCR has taken a number of schemes and programs to take care of agriculture and farmers' welfare. The farmers have disproportionately affected the Rs. 16.50 lakh crores for 36 lakh farmers in the country. In the past, fertilizers and seeds have been put in a queue. States with surplus electricity are also not giving free electricity to farmers today. The Telangana government is the only government giving Rs 8000 per acre for farmers to recognize farmers' livelihoods and farmers. Have they done anything when the Congress was in power? My Telangana Koti Rathanala Veena is Dasarathy said, which means ... Chief Minister KCR is my Telangana Koti acre land. It is to be done to prove that this is an attempt to make lakhs of acres in the constituency to bring the crops in the State into cultivation. Today, the entire work of the Kaleshwaram project is harshi. One day we are using two lakh cement bags for the Kaleshwaram project work, and to understand how the project is functioning. CM KCR, who has identified the farmers' liabilities for agriculture, said that they do not have such a situation and give the farmers a great opportunity to be the king of the eight thousand rupees a year, and what is the chief minister of the Congress party in the country? State Congress leaders questioned. The total amount of Rs 12,000 crores has been allocated in the Budget for the purpose of investing 15 lakh acres. We have built 18 lakh metric tonnes of paddy in the state at Rs 1, 024 crores. Did the Congress think about it anyway? Questioned. If the people have seen this development and welfare programs, Speaker Madhusudanachari is good to you for Bhupalapalli MLA and you cannot do that in Bhupalpalli, but he is not going to be able to do this. To continue with this development, you have been given the opportunity to win the KCR as CM, Madhusudanachari as the MLA.